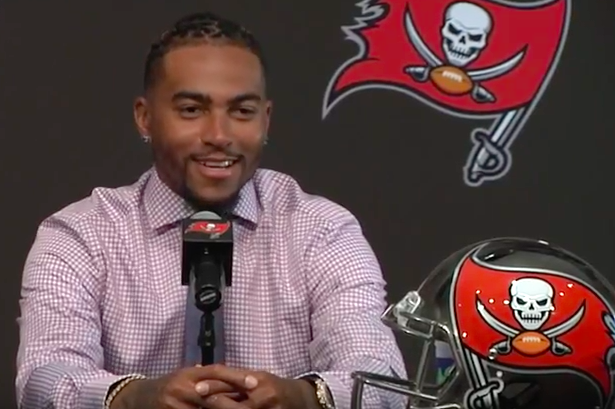 DeSean Jackson answers questions at introductory press conference with the Tampa Bay Buccaneers. Who can forget one of the most crushing days in Philadelphia sports over the last decade? What has the rest of the NFC East done in free agency so far? A dramatic Eagles comeback against the Arizona Cardinals in the 2008 NFC Championship Game, marked by a tipped 62-yard touchdown pass from Donovan McNabb to DeSean Jackson, appeared to be the sort of swing in momentum that would send the Birds back to the Super Bowl. Of course, it didn't. The Eagles lost 32-25 and the Cardinals didn't even do Philly the favor of beating Pittsburgh in the Super Bowl. It's best not to live in the past, but after a 2017 build up to free agency in which the Eagles were rumored to be pursuing a reunion with Jackson, the veteran wideout's introductory press conference in Tampa Bay had a few interesting tidbits for Philly fans. It doesn't really sting, either, because the Eagles landed Alshon Jeffery and Torrey Smith. Below is Jackson's introductory press conference with the Buccaneers, where he signed a three-year, $33.5 million deal to play alongside Jameis Winston, Mike Evans. The reminiscence on the 2008 playoffs comes at the 15-minute mark. It's funny because not only does he call it the NFC East Championship Game, but he also seems to remember Larry Fitzgerald making the game-sealing touchdown catch, when in fact it was just a lame, lame 8-yard pass to Tim Hightower. His response to being 30 years old comes at around the 10:50 mark. As for some insight into the wideout's choice to play in Tampa, Jackson points out that his NFL career has been based out of home stadiums in cold weather cities. As a product of Cal, he saw Raymond James Stadium as a place where it might not hurt as much to get tackled. At least he's honest. Finally, in a feel-good story, the former Eagles decided to buy his number 11 jersey from the Bucs' Adam Humphries. Terms of the deal were not disclosed, but the money will be going to charity.